Diabetes is usually a lifelong (chronic) disease in which there are high levels of sugar in the blood.Diabetes can be caused by too little insulin, resistance to insulin, or both. 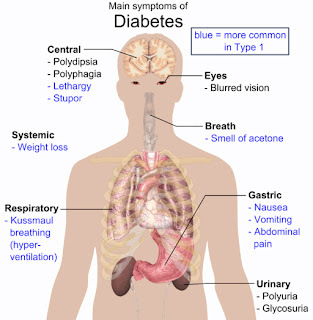 Type 1 diabetes can occur at any age, but it is most often diagnosed in children, teens, or young adults. In this disease, the body makes little or no insulin. 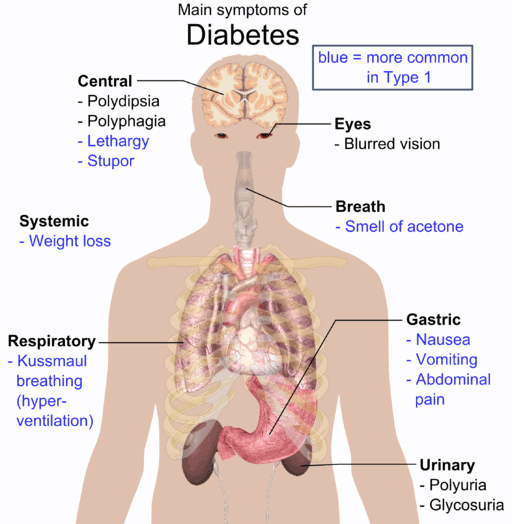 Type 2 diabetes makes up most diabetes cases. It most often occurs in adulthood. However, because of high obesity rates, teens and young adults are now being diagnosed with it. 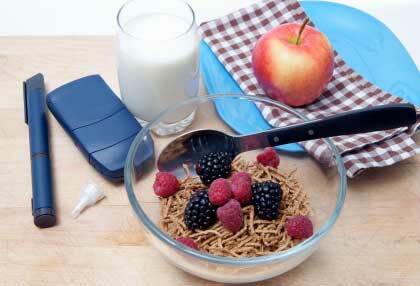 Prediabetes is a common condition related to diabetes. In people with prediabetes, the blood sugar level is higher than normal but not yet high enough to be considered diagnostic of diabetes.Prediabetes increases a person's risk of developing type 2 diabetes, heart disease, or stroke. Diabetes can lead to some serious problems like you could have eye problems, including trouble seeing (especially at night) and light sensitivity. You could become blind also.Your feet and skin can get painful sores and infections. Sometimes, your foot or leg may need to be removed.Nerves in the body can become damaged, causing pain, tingling, and a loss of feeling.Because of nerve damage, you could have problems digesting the food you eat. This can cause trouble going to the bathroom. Nerve damage can also make it harder for men to have an erection. Treatingboth type 1 diabetes and type 2 diabetes involves medicines, diet, and exercise to control blood sugar levels and prevent symptoms and problems. Use artificial sweeteners (Avoid sugar honey, jaggery). Eat whole grains like wheat, bajra, ragi, jowar, brown rice, oats, brown bread, poha, upma, whole pulses, dals, sprouted pulses. (Avoid sabudana, maida & bakery products). Cut down on rice(Avoid Basmati rice). Eat plenty of all green leafy vegetables and salad. Cut down on ghee, butter, malai, cheese, etc. Use seasoning like lemon, zeera powder, dhania, pudhina to add flavor. Egg white, deskinned chicken and grilled fished are healthy non vegetarian dishes if used in moderation. Use cow milk and its products instead of using buffalo milk and its products. Drink plain water buttermilk, coconut water, dal water or vegetable soup.